This concert is part of their 2016 “UK- Fund Raising Tour” for the victims of the Chernobyl Disaster. some tickets will available at the door on the night. News from the Guildford Accordion club who are hosting Alan Young on the 19th of February. superb guest artists for this year so lots of entertaining evenings in store. February 28th….Cambridge Accordion Club are organising another Accordion Orchestra Day with MD Nigel Pasby and Helen Newton. Cost for the day is £15 which includes refreshments in the breaks. To reserve a place email aod@cambridgeaccordionclub.co.uk or phone Susanna on 01487 711337. February 19th….Alan Young is coming all the way from the Isle of Wight to entertain us. A real treat so do not miss him. March 25th….the club date is changed due to the hall being used for the Panto; Oh no its not – oh yes it is! So this is the fourth Friday instead of the third and it is also Good Friday but we will be here so make sure you are too. Both of our stores will resume trading with their normal opening hours from Saturday 2nd January onwards. This weeks featured accordion is this classic Scandalli Scott Wood Four vintage accordion dating from the 1930’s and built in Italy by the renowned Scandalli factory. This classic instrument features a sought after curved keyboard design, and a three voice tremolo tuning. The instrument is still in full working order which is extremely rare for a pre war accordion of this age. Finished in a very attractive pearl white jewled casework. 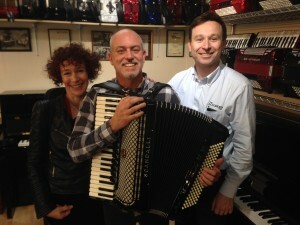 We are pleased to have been able to assist our long standing customer and friend George Whitfield in purchasing his dream accordion, a top quality customised version of the legendary Scandalli Super VI. 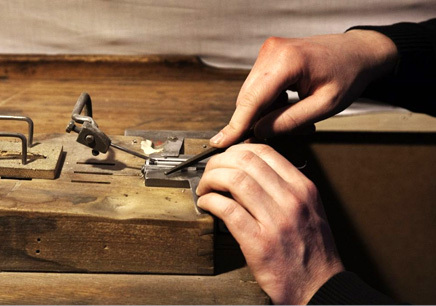 Painstakingly hand crafted in the Italian town of Castalfidardo, the Super VI is widely regarded as being one of the finest accordions ever produced. George is a professional musician who regally travels internationally, and will be officially christening his beautiful new accordion in the first of four shows in the Icelandic capital, Reykjavik next week. The world class accordionist Gianluca Campi will be performing at the Guildford Accordion Club on the 25th of September. I do hope you can come along to hear this very special accordionist.. I have seen him and he is amazing! Please note this is not the third Friday but the fourth. quiet this evening. All the more time for the Playalong and Party Pieces. Just a reminder – Crawley Accordion Orchestra is keen to recruit new members with or without experience of playing in a group. The Orchestra meets for rehearsals every Thursday from 7.45 to 10.00pm at Ockham Parish Rooms, Ockham Lane, Ockham, Woking, Surrey, GU23 6NP. Call Bernard on 01342 712131/07795 276261 or just go along to a practice evening to find out more. There are some wonderful guest artists booked later in the year. Do check our website if you can to find out who they may be. Manic day yesterday with a wonderful end at the Littleborough Rushbearing ceilidh! 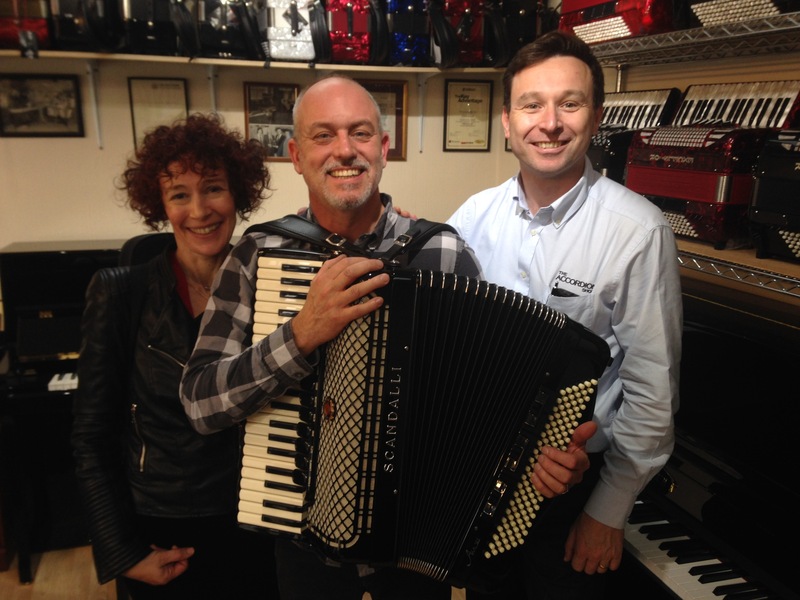 Huge thanks to the wonderful Jack and Matthew for all their help and to Helen, and Pete at The Accordion Shop (Rochdale branch) for sorting us out an accordion so quickly! Cheers guys! Looking forward to hanging out at the Rushbearing today, come and say hi!